Estate of the artist [d. 1953], Paris; (Wildenstein & Co., Inc., London and New York); sold 3 December 1962 to Mrs. Ailsa Mellon Bruce [1901-1969], New York; bequest 1970 to NGA. Letters of 8 February 1978 and 22 October 1985 from Wildenstein & Co., Inc., in NGA curatorial files.
] Date according to the Ailsa Mellon Bruce notebook now in NGA archives; the invoice was dated 13 April 1962. Venice XXVI Biennale, 1952, no. 42 as La Darsena a Deauville. Homage à Raoul Dufy, Societé des Artistes Honfleurais, Ville de Honfleur, 1954, no. 38, no repro. 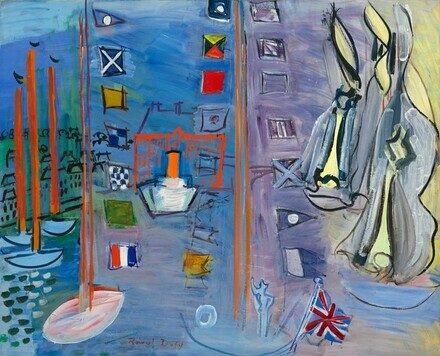 Dufy, Musée des Beaux Arts, Lyon, 1957, no. 58, no repro. Raoul Dufy, Hayward Gallery, London, 1983-1984, no. 119. Obras Maestras de la National Gallery of Art de Washington, Museo Nacional de Antropología, Mexico City, 1996-1997, unnumbered catalogue, 184-185, color repro. Extended loan for use by The White House, Washington, D.C., 1999-2010. Monet to Matisse - On the French Coast, Museum of Fine Arts, St. Petersburg, Florida, 2015, no. 18, repro. European Paintings: An Illustrated Catalogue. National Gallery of Art, Washington, 1985: 139, repro. Van Doren, Lawrence N. Dufy Appreciations, 1997, repro.